As the summer drew to a close, Mother, Cissy and I were often hard at work morning, noon and night - or at least it seemed like it. Day after day, we harvested the herbs and produce from our garden, and collected plants from the woodlands and moors. The scullery sink and the kitchen table were invariably filled with bowls and flasks and pestles, and the shelves in the pantry and the storage spaces in the outhouses steadily filled with jars and flagons and casks. More often than not, we were all exhausted by the time we got to our nightly ritual of brushing each others hair and washing each others bodies. Even so, we rarely neglected our other requirements. Cissy was so good, and I was learning fast, and we were each able to bring one another to a climax and assuage the most urgent of the needs of our bodies. Despite our increasing expertise and frequent ministrations, I had felt there was something missing for some time. Eventually I had realized what it was: the feeling of being penetrated, deeply and thoroughly; the sensation of a phallus between my legs. I was beginning to need this attention most urgently. It was beginning to put our pact at risk, as I found myself looking with a certain liveliness at the younger unmarried or widowed men of the parish, or the itinerant laborers who tended our smallholding. I grew so bold as to mention my feelings to Mother and Cissy in our evening conversation before supper. We had already enjoyed the customary releases of our tresses and our bodies, and we were now sitting in front of the fire once more. Mother was reclining in her favorite chair while Cissy carefully bathed her most intimate regions. "The devil grows strong inside you," Mother said, "I suppose I am not surprised to hear that the demon between your legs now needs further release. We shall have to see about providing assistance in your hour of need." Mother sat for a long moment staring at the fire, then turned and looked at me directly. 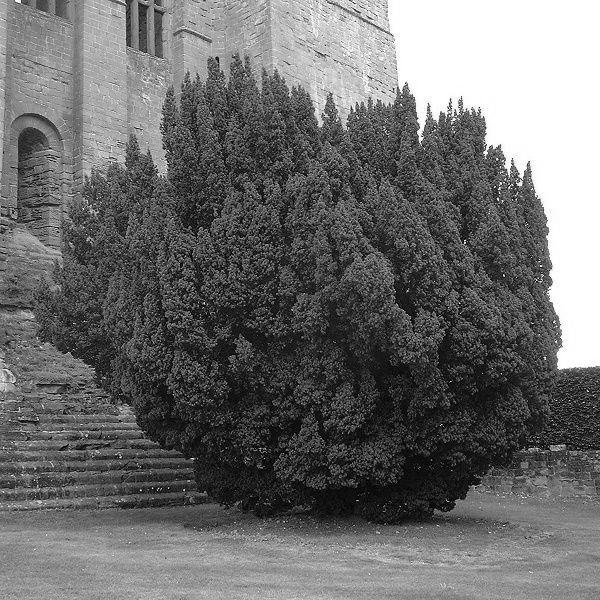 "Now, Abby," she said, "Tell us what you know about the Yew." I was entirely puzzled by the change in direction of the conversation. Even so, I instinctively sat up straight, drew my ankles together and put my hands in my lap, as if I was back in the schoolroom or attending closely one of my Mother's own lessons. Cissy too immediately adopted a similar pose, looking suddenly very prim and proper. She looked so much at odds with our hitherto abandoned and still naked condition that I had to bite my lip very firmly to keep from laughing out loud. "The Yew is an evergreen tree with red berries and dark green leaves," I said in my best schoolgirl fashion, "It is very slow growing and lives for a great many years. The wood of the Yew tree is amongst the hardest and most resilient of woods, and is frequently used for bows and for the handles of tools of all kinds. It is found most often in churchyards and on hallowed ground." Mother held up a hand and I fell silent immediately. "Very good," she approved, "And you will know that there are several such trees growing around our village church. But, how old is the church building itself?" I thought quickly. I brought to mind the date carved into the foundation stone by the altar, a feature I had stared at idly while another sermon droned on around me. I did a quick calculation in my head. "The oldest part of the church," I said carefully, "Is one hundred and thirteen years old." "And the Yew tree that stands by the gate. How old do you think that is?" I thought about its gnarled and twisted boughs, its hollow trunk and spreading girth. "It must be many hundreds of years old," I answered. Mother raised an eyebrow. "So?" "So the Yew tree was already ancient even when the foundation stone of the church was laid," I said slowly, realization dawning. "Indeed," Mother replied, looking pleased with my eventual perspicacity, "The tree was reputed by our forebears to have connections with the old Gods and Goddesses." "You have forgotten something else about the Yew. Can you remember what that is?" I sat dumb. I could not think of anything. "Almost every part of the tree is poisonous," Cissy chirped up, "Leaves and seeds, even the wood is dangerous if not handed carefully." "Well done, Cissy," Mother said, "Although it has medical qualities, too. As so many things in this world, toxic if used careless or to excess, but beneficial with care and moderation. A man poisoned by the Yew gives the appearance of being possessed by a demon, while there are certain weaknesses of the heart and arteries can be treated with an extract of the seeds of the Yew, as can certain complaints of the womb." Mother stood up and moved across the parlor to the sideboard. It was clear that she was looking for something. After a few moments, she turned and held up an object for our inspection. It was a large and intricately detailed phallus of carved wood, its base merging into a domed hemisphere the size of an upturned tea-cup. The curved surfaces were polished and varnished. I could see that once it had painted a bright red, although I could see that the paint was faded and worn in a few places. It looked like a tool that had been expertly made and then subject to many years of hard use thereafter. "This is made from the wood of the Yew," Mother said, holding it forward for me to take, "It is an old piece, an ancient thing and carefully treated to neutralize the toxins." Cissy was wide-eyed; it was clear that she had not seen this device before. "It looks," she said with a wicked giggle, "Like a Devil's horn." "So now we are able to help poor Abby with her condition," she said, addressed Cissy. Cissy needed no further encouragement and, in all honesty, neither did I. She knelt down, her head between my legs, her tongue already pressed between my lips to moisten them. There was no need. The sight of the painted phallus had made me instantly wet and open, a fact that Cissy realized quickly enough. She drew back and looked into my eyes with a mixture of wonderment and lust flitting across her features. "You really want this, don't you?" she breathed. "Oh, Cissy, I do," I cried, my urgent need suddenly getting the better of me. Mother stood the flat base of the device on the stool in front of the fire. I stood, squatted over the erect tip, then pressed myself down over the carved wooden phallus forcing the warm hard wood deep inside me. I cried out, unable to contain my need any longer. I bucked and jerked wildly, uncontrollably, rapidly bringing myself to the brink of another immensely satisfying climax. Once again, it seemed, I enjoyed the devil within. If you have enjoyed this story, why not explore the other stories in the Fantasy and Science Fiction collection? A wild mixture of erotica, fantasy and science fiction from the author of The Marquis Doll Adventures.